Like most of the major champagne houses in Reims, the cellars at Taittinger are located in cavernous Gallo-Roman chalk pits dating from the fourth century. Just as I was dropping off to sleep last night, Stephane nudged my shoulder and asked if I was planning to write a blog post today. Rather surprised by his question, I mumbled that I was and started to return to that luxurious state when you're just about to.... "What are you going to write about?" Jolted awake, I collected my thoughts and responded that the post would probably feature the major champagne houses. "Are you going to mention that the Cathedral of Reims is where 33 kings of France were crowned?" was the next question that he fired at me. When I replied that I wasn't intending to write about it because we hadn't seen it, Stephane chuckled and said that was the point he wanted to make. It's public confession time: After Stephane invited me to visit the cathedral and one major champagne house in Reims, I commandeered the entire operation. 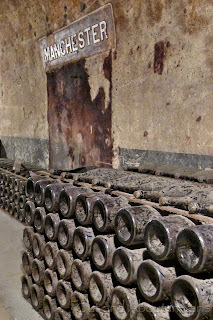 During "his" weekend, we visited Taittinger, Pommery, Moet et Chandon and the cellar at Maison des Vignes de Verzenay. We did not at any point during the aforementioned weekend step inside the cathedral. But since it's a World Heritage UNESCO site that has been around for 800 years, I'm fairly certain that it will be there during our next visit to Reims. The question is, will Stephane have the chance to see it. After all, I still want to visit Ruinart, Mumms and Veuve Clicquot! With the exception of Taittinger, its advisable to reserve tours of the major champagne houses in advance. Ruinart seems to be the one that everyone wants to visit so book it first. All of their French and English tours were already full when I contacted them 5 days before our trip. To maximize your time, study a map to see which champagne houses are located next to each other and schedule accordingly. For example, Pommery is so close to Veuve Clicquot that they shared adjoining tunnels in the cellars when both houses were owned by LVMH Moët Hennessy - Louis Vuitton. Dress warmly. The temperature in the cellars ranges from 8-12°C (46-54°F). Wear sensible shoes because the cellars are dark. A man on one of the tours had a hard fall when he misstepped. If your mobility is limited, ask if the champagne house has an elevator to the cellar. Our guide escorted people to the elevator at Taittinger but I didn't notice one at the other houses. 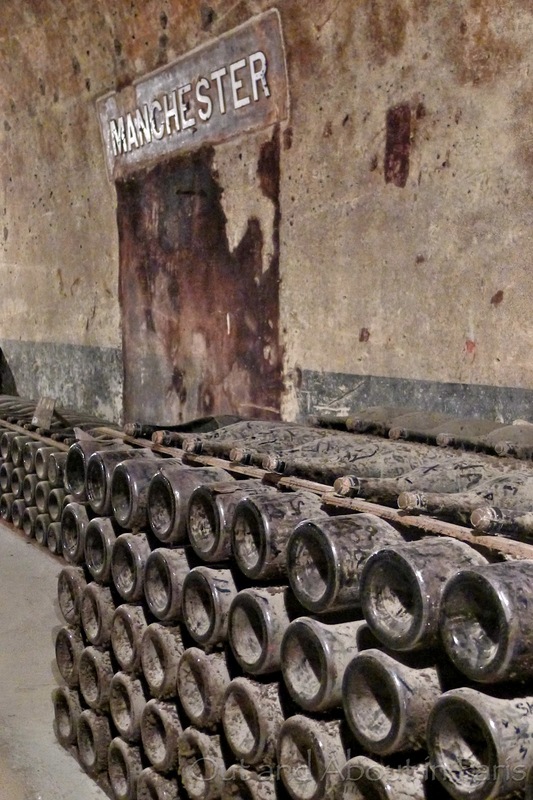 1874, 1904, 1943, 1945... Exceptionally old bottles of champagne that are part of Pommery's historical archive. While we didn't see any of the actual production process at Taittinger, Pommery and Moet et Chandon, all of our guides were very knowledgeable and did an excellent job explaining how to make champagne. At the two houses in Reims, they also recounted the fascinating history of the Gallo-Roman chalk pits that were constructed in the fourth century and used as a place of refuge by 10 - 15,000 people during World War I. The maze of passages at Pommery also housed a hospital, a school and a post office. During the tours, we also learned about the history of each house. I particularly liked that Madame Pommery, a very clever businesswoman who assumed control after her husband died, instructed her salesmen to "Pommerize the world!" At that time, Pommery champagne was produced according to regionalized taste preferences so the champagne for Manchester was stored in a separate area from the champagne for Zurich, Bern, Buenos Aires, etc. Not only was Madame Pommery a savvy business woman, she was also a great patron of the arts who commissioned an artist to carve massive murals in the chalk walls in the cellars. The one above shows people drinking champagne in the eighteenth century. As they had not yet started disgorging champagne, opaque glasses were used to conceal the sediment. And last but not least, all of the tours ended with a tasting session and the opportunity to buy some bottles of bubbly to take home. After doing some quick price comparisons, we only bought a couple of bottles at Pommery because the champagne is the same price as it is at the stores in Paris. We did, however, take a case of Emmanuel Pithois' champagne home with us because it isn't available here. Here are links for some of the champagne houses: Taittinger, Pommery, Moet et Chandon, Ruinart, Mumm and Veuve Clicquot. If you would like to see more photos from our trip to Reims and Epernay, be sure to visit Out and About's Facebook page. I already posted some pictures and plan to add a few more. For those people who like to put ice in their champagne, Moet et Chandon has created Ice Imperial, the first ever champagne to be served on ice. I'm surprised Ruinart is such a popular vineyard, as it's almost an unknown option here in the States. I like it a lot. I know! Although I guess that Ice Imperial would be good to use in cocktails. 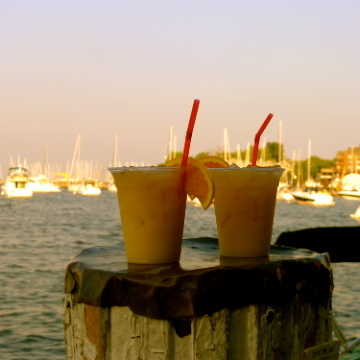 It's supposed to be sweeter than regular champagne and very easy to drink. Whenever I asked people, including our tour guides, about their favorite champagne house tour in Reims, they answered Ruinart. I think that it's more about the tour than the vineyard, although I don't know what makes it better than the other tours since they were already fully booked when we went. Taittinger is the only big one I've visited. We have our own smaller champagne grower, Forget-Brimont, that we love going to visit. When Relationnel and I learnt to jive about 15 years ago, our teacher turned up one night with some really nice champagne made by her father! Their 1990 millésimé was particularly good. We need to got back there soon as our stock is nearly exhausted. Another wonderful place to go in Champagne is Maillé-en-Champagne at Pentecost. The whole village is closed to traffic and the local winegrowers open their cellars to winegrowers from other parts of France. No champagne on sale during the weekend. The village turns into a wonderful wine and food fair. One of our very favourite venues. Thanks for including the name of your champagne grower. I just googled Forget-Brimont and saw that it's not too far from Verzenay. 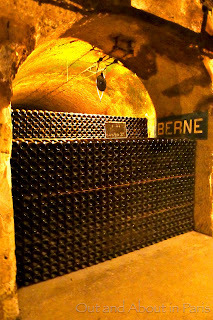 It looks like another cellar to visit when Stephane and I return to Champagne...maybe for Pentecost! We used to live in a wine growing region in Switzerland and going to the village festivals, etc. was always a favorite. I love seeing the pictures of the old wine cellars. Have you ever read Wine and War? It's a great little nonfiction book about the fate of French wine & champagne cellars during World War II. It talked a lot about the importance of wine in French culture and the homefront experience during the war. I just took a look at Wine and War on Amazon and have added it to my next book order. Thanks for the recommendation. It sounds very interesting. While scanning the reviews, this quotation caught my eye: "To be a Frenchman means to fight for your country and its wine." I would say that a visit to the chalk caves of Taittinger really is a visit to a cathedral...of sorts! It really is, especially because the Taittinger caves are located on the site of a former monastery and the Pommery caves used to house France's lowest chapel. It still has a statue of Mary in it. Liebe Mary Kay, gerade habe ich in Ihrem Blog entdeckt, dass Sie sowohl in Deutschland wie auch in der Schweiz gelebt haben. Sprechen oder lesen Sie auch Deutsch? Even though I took German lessons for awhile, I can only speak and read a bit of German...just enough to get by in restaurants, stores, etc. I just took a look at your blog and saw that you're in Vienna. We have wonderful memories of our visits there. Hope You will come back to Vienna. I'm shure I know some places You'll not finde in tourist guids. Let me know in time. I have been following your blog for sometime now (found you on T.A. Paris forum). I really enjoyed this post and can't wait to read about your next visit to Ruinart, Mumms and Veuve Clicquot. Thanks for commenting! I'm not sure when we'll return to the Champagne region but it's definitely high on our list of things that we want to do. If you're interested in champagne and have a smart phone, Mumm has a good free app called "Champagne Protocols". What a great weekend trip. I really hope to go to Reims or Epernay one day. Exactly. That's what I keep telling Stephane! If it's either Reims or Epernay, I would recommend Reims because that's where the chalk caves are located and they have an interesting history all on their own. Although not a new idea, champagne bottles containing labels with specifically chosen designs and individualised messages, is new to many people. A simple gift made unique, and one that won't be the wrong size, shape, or colour. No one will return this gift. I sent this post to my daughter just before she went to Champagne last weekend and she found extremely useful. Thank you for the great information. I'm glad that your daughter found the information to be useful. Thanks for letting me know!